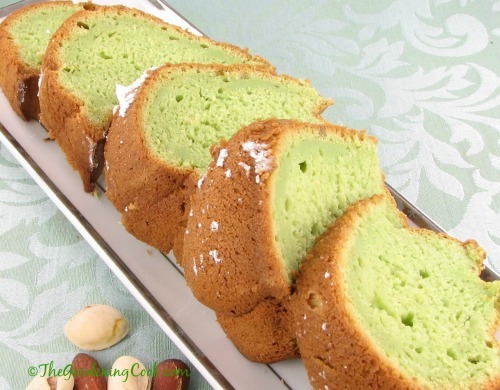 This recipe for pistachio and almond cake could not be easier. 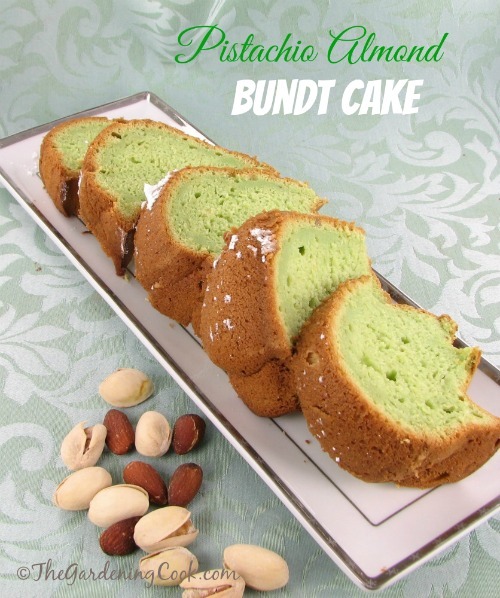 It combines a yellow cake mix with pistachio instant pudding and almond extract as well as normal baking ingredients. The amaretto liqueur gives the cake a delicious almond taste too. The end result is moist and delicious and you will only have to spend a few minutes making the recipe. I like making the cake in a bundt pan. (affiliate link) To me it looks a bit fancier than a layer cake and requires no icing unless you want to make a glaze for the cake. I just dust it with powdered sugar and serve. Makes a very nice ending to a dinner party, and shhhh….don’t tell your guests you took short cuts. Like bundt cakes? 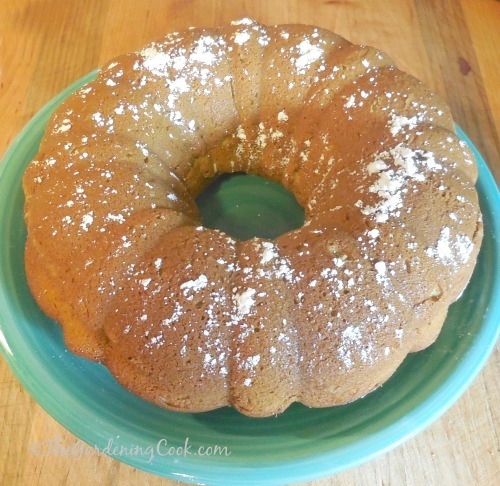 Be sure to try this orange bundt cake with a citrus glaze. It is really yummy! Preheat oven to 350 º F (175 º C). Grease and flour a bundt pan. In the bowl of your stand mixer, combine the cake mix and pudding mix. Make a well in the center of the mixture, and pour in the eggs, water, canola oil, amaretto, almond extract and green food coloring. Blend ingredients, then beat for 2 minutes at medium speed until it is well combined. Pour the mixture into the prepared bundt pan. Bake in the preheated oven for 50 to 55 minutes, or until cake springs back when lightly pressed. Cool in pan about 15 minutes. Turn out onto a wire rack and cool completely. is there a reason the pudding is sugar-free? Hi Amy. No reason other that it is what I have on hand for pudding mixes. The main thing is that it is an instant pudding, not one you cook on the stove.